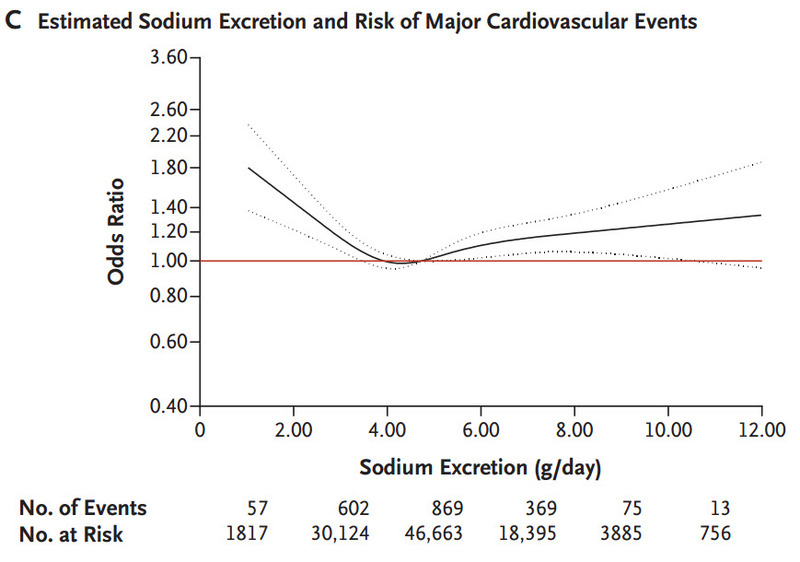 The August 14, 2014 issue of the New England Journal of Medicine contains three papers on salt intake and health. The third of these is so layered with assumptions that I won’t discuss it. I have previously written about recommendations for optimum dietary intake of salt. In 2011 the American Society of Nephrology endorsed guidelines from the Department of Agriculture advising that Americans cut their intake of salt to between 1500 and 2300 mg a day depending on age, ethnicity, and health status. I commented that these guidelines had little or no rigorous science to support them. 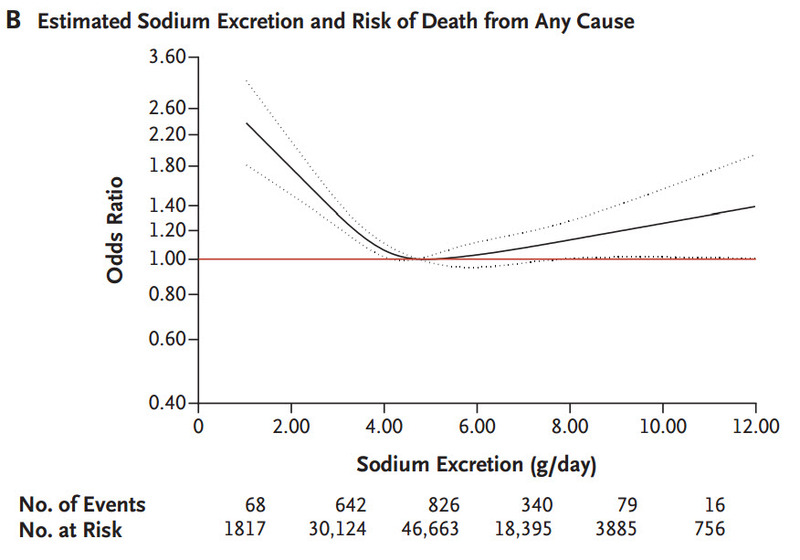 Association of Urinary Sodium and Potassium Excretion with Blood Pressure and Urinary Sodium and Potassium Excretion, Mortality, and Cardiovascular Events are from the Prospective Urban Rural Epidemiology (PURE) study. The first of these papers examines the relationship of sodium and potassium intake on blood pressure. There were 102,216 adults from 18 countries in the study. 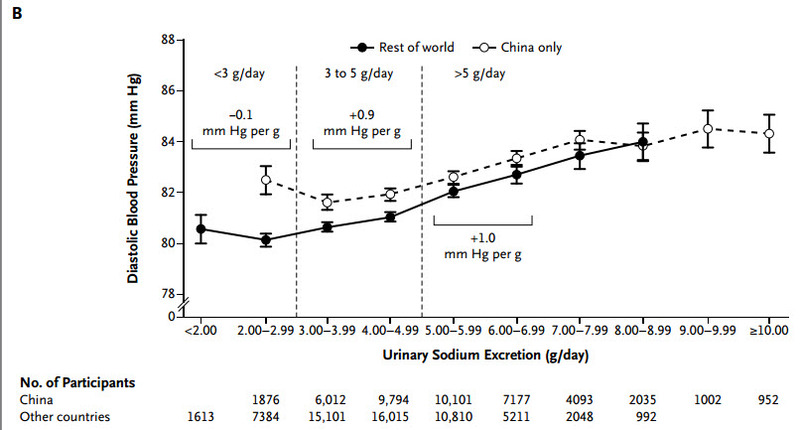 The effect of sodium intake on BP was non linear and only apparent at sodium intakes greater than 3 to 5 g/day. 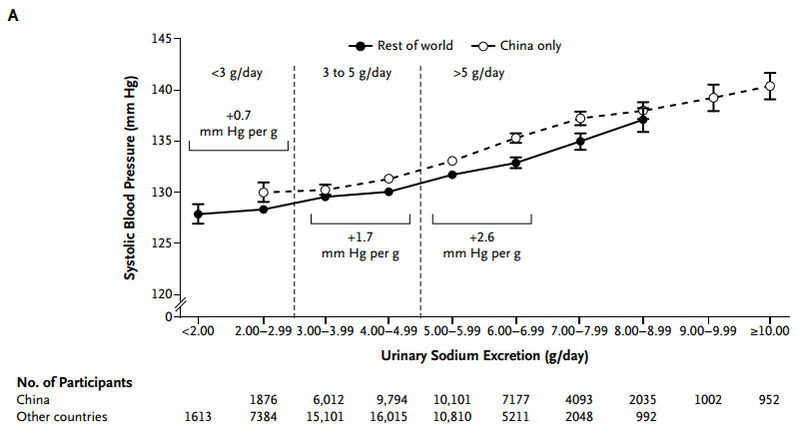 Hypertensive BPs were observed only at Na intakes well in excess of 6 g/day. Note that these salt intakes are two to three times the recommendations of the Dept of Agriculture which were endorsed by the ASN. 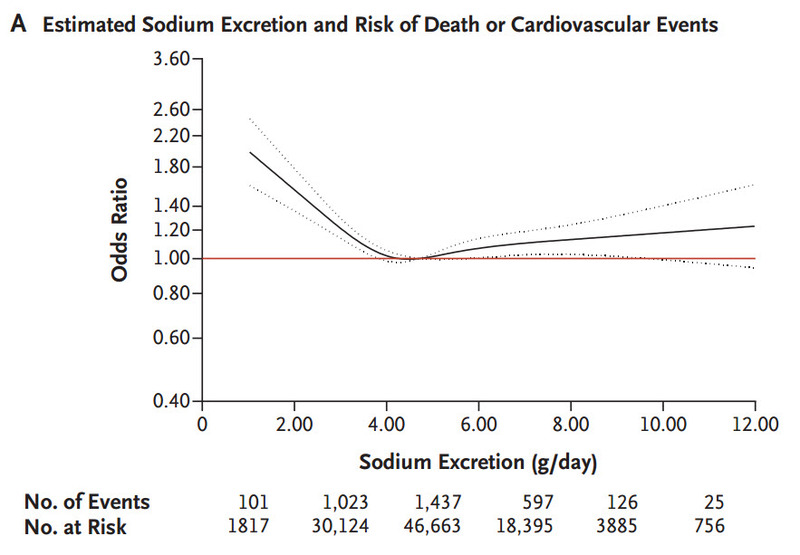 The second paper looks at the relationship of sodium intake to mortality and cardiovascular events. There were 101,945 subjects from 17 countries. The study’s finding are illustrated in the 3 graphs below. As virtually all ingested Na is excreted in the urine, the investigators of this study used Na excretion as a marker of intake. Note that at both extremes of Na intake the incidence of adverse effects was increased. So how did Agriculture and the ASN go so wrong? They committed the near universal error of assuming that which they wished or thought to be true. They got out ahead of the data. Scientific rigor is often no fun. It constantly limits what you can conclude. It’s much more fun to tell people how they ought to behave even if the supporting evidence is weak.